For this Iron Craft challenge we were allowed to choose from any of the 2013 challenges to repeat. I didn’t go very far back and repeated challenge #24 Holiday. My husband Matt and I collect Christmas ornaments (or things we can turn into Christmas ornaments) when we travel. It gives us a souvenir to shop for and something to remember each of our trips with. 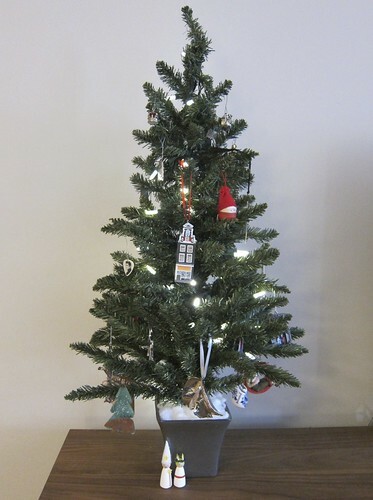 We have a small table top tree we use to display those ornaments (though I think we are going to need a bigger tree soon). I’ve never been very happy with the look of the plastic base, especially with the tree being front and center in our living room. 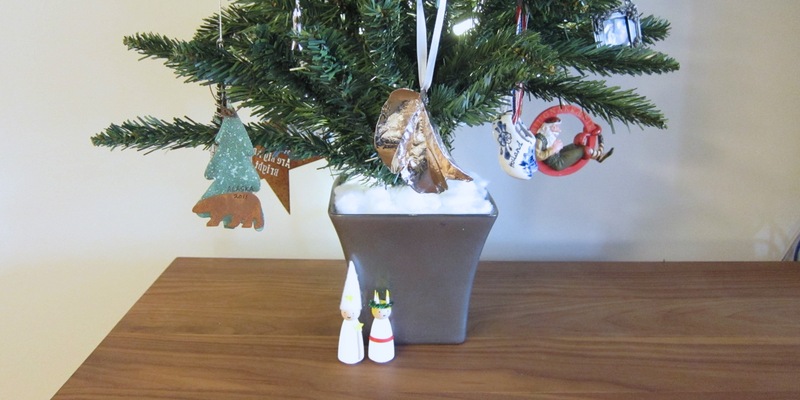 I had seem people cover their tree bases with things like baskets and thought I would try to do something similar. We tend to kill houseplants, so there is a little stack of empty pots in our storage room. One of them ended up being the perfect solution. 1. 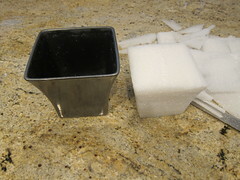 Use the serrated knife to cut the styrofoam to fit snuggly in your pot. It is best to take a little off at a time. This is a messy little project. 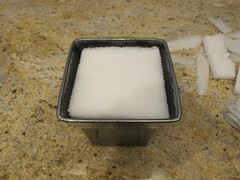 You want the top of the styrofoam to be about 1/2″ lower than the top of the pot. Do not throw away the styrofoam scraps. 2. Take the legs off your tree. 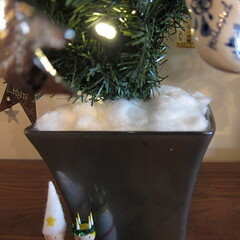 Make a hole in the middle of the styrofoam big enough to fit the tree base. I used the knife and a melon baller to make the hole. 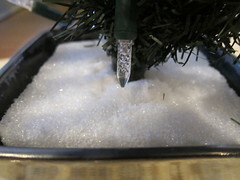 I went all the way through the bottom of the styrofoam which made the tree stabler. 3. 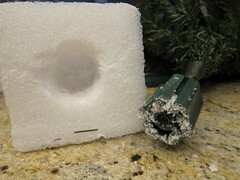 Put the tree in the hole and then pack around it with styrofoam scraps to secure it in tight. My tree had a fatter base than “trunk” so this was really necessary. Make sure it stands straight. 4. If you want you can cover the top of the styrofoam with torn up cotton balls or batting to look like snow or use a floral moss for a more garden effect. 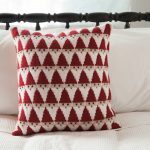 I used cotton balls. So much nicer looking than the cheap plastic legs! 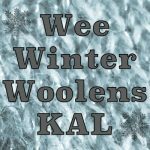 5 years ago by Kat in Challenges , Christmas , Craft Projects , Crafts , Holiday , Iron Craft , Projects | You can follow any responses to this entry through the RSS feed. You can leave a response, or trackback from your own site.